These unique gel candles are handmade in Maine by Bonnie Hayes. 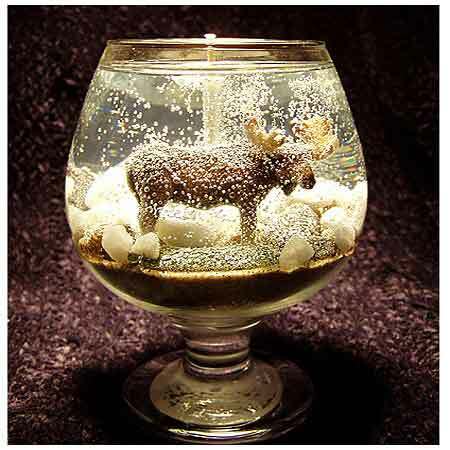 The wildlife gel candle pictured here shows her creation of a moose in a snowstorm. Other wildlife options include an eagle, wolf, bear or deer. These would make an especially interesting display in a den or country cottage, although they would certainly add lovely winter décor to most living rooms. To see more of Bonnie’s gel candle art, visit Main DeLight: Seascape and Wildlife Gel Candles. Thank you so much for your kind review of my work. It is really appreciated. I enjoy making them and love to hear feedback like this. Also check out my seascape and lighthouse candles as well. Thanks again. My boyfriend purchased me a sea-themed candle from the Blue Hill Fair this year. It was an absolutely wonderful surprise. I just love it! I saw you at the Big E this year. I was wondering if you still made the two black kitties gel candle? If so how much does it cost and the cost of the shipping? My mother bought me one of these beautiful candles at the Margaretta Day fair in Machias. It is beautiful and unique, and when lit the scene comes to life almost magically. It’s so pretty, I don’t want to burn it all away quickly, so I light it for just a few minutes each day to just sit and admire the glowing scene with my son before he goes to bed. He is 2 and completely captivated by it! My girlfriend Desiree found your website and said I should look at it. These candles look wonderful. I did order the Nubble candle for my Dad today so of course I haven’t received it yet. I really wanted to comment just how nice my girlfriend said Bonnie was after speaking on the phone. Like my own Dad at 75 still working full time, Bonnie and her husband are people to admire for working so hard. I can’t wait to get the candle and give it to my Dad for Christmas and see my dad’s eyes. After a mishap with shipping (not the sellers fault) I received the candle and the replacement candle that was sent on the same day. My Dad was so happy with the candle that I ended up purchasing the replacement candle as well. I thought I would be sending at least one candle back if I did receive both candles eventually (which I did) but the candles are so well done that we contacted the seller and offered to pay for the replacement candle as well. I am impressed that the seller thought enough about the customer to send out another candle without hesitation. I will most definitely do business again with Maine Delight. Thank you so much for making my Fathers Day on New Years Eve.